Everest Base Camp is a dream destination for any mountain lover. However, trekking long hours through off-the-beaten route for several days is not everyone’s cup of tea. Everest Heli Tour makes it possible to reach this mountainous paradise in just over 30 minutes. If you are contemplating about experiencing this journey, we definitely recommend it! But first, here’s a list of 6 things to know before undertaking Everest Heli Tour. Before starting any journey, it is very important to know what you will be doing throughout the time period to prepare accordingly. It’s even more critical if you’re going to spend a majority of your time in airspace. To put it simply, Everest Heli tour is a private helicopter ride for 4 to 8 people, depending on the size of the aircraft, to the basecamp of the world’s highest peak. The journey preferably starts in the morning, from Tribhuvan International Airport (TIA). The helicopter will land at Lukla for a refueling break. During this narrow timeframe, you can get some extra breakfast and explore this beautiful Sherpa village. From there, you will be flown over Namche Bazaar and few other Sherpa villages before you reach base camp. Some itineraries also include a visit to Kala Patthar, the most famous viewpoint in the whole Everest region. Make sure to discuss that with your service provider beforehand to include this in your itinerary. Reaching Everest Base Camp in a little over 30 minutes is not something to experience often – it is a rare luxury. You won’t have to go through any kind of hardships like blistered feet, numb knees, and risks of altitude sickness. And that’s why, it is quite expensive. Depending on the travel agency, you can be charged anywhere between USD $1200 to $1500 per person. If you go in a group, you will definitely land some great deals. Other than that, the price also significantly varies depending on the time of the year. While the prices may spike during spring and autumn, you can land good bargains during monsoon and winter. 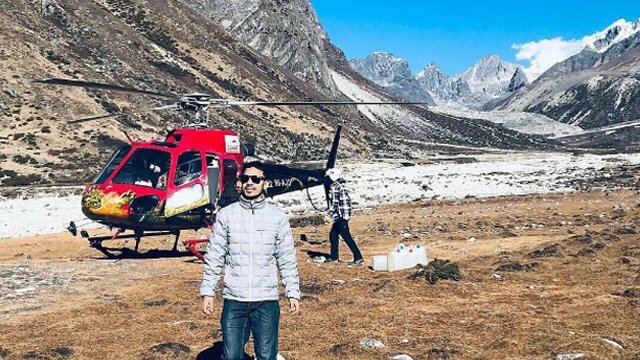 Although Heli Scams is one of the most longstanding issues faced by the Nepalese aviation industry, it only came to the light last year, following exposition by number of media hubs including international platforms. As tourism business continues to gain momentum, the number of agencies offering Heli rides illegally and without proper permission has increased rampantly. Companies often make counterfeit bills and documents and make illegal claim against the passenger’s travel insurance. Some travel agencies have even stooped low to the point of coaxing passengers to give fake confirmations to claim insurance charges. Today, you can find a travel agency at every nook and cranny of the city. Travel and tourism are very lucrative businesses, and not everyone has your best interest in their heart. From charging unfair and high prices to claiming fake insurance, some companies will do anything to increase their overturn. Thus, while choosing a travel agency, make sure to research about credibility and testimonials. Don’t fall for bargains that may seem to good to be true. Visit a few travel agencies and compare prices and look for recommendations from family and friends before you decide on anything. Similarities in mode of transportation and region often leads to a lot of confusion between different kinds of flights carried out in the Everest region. Many companies also offer mountain flights that take place through airplanes. Contrary to heli tours, these flights are uninterrupted and do not land anywhere during the trip. However, these flights tend to last a longer duration than a Heli tour. Also, though it will save you $100 or $200, you will be sharing the plane with many other passengers. While both experiences have their own set of pros and cons, heli tours definitely have an edge as it allows you to land and explore the vicinity. Like all incredible voyages in the world, this one too comes with certain risks. Accidents and casualties during Everest Heli tour are extremely rare – to the point that it can be unkempt. However, every day and every flight are different. We have to research and prepare well for unforeseen circumstances like altitude sickness and bad weather. However, the crew members are really well prepared about what to do in case of an emergency, so you will be in safe hands throughout the journey. Next articleHow to Prepare to Everest Base Camp for Beginners?